You should not assume that the Z sampling distances of your 3D stacks are the ones reported by the microscope just because it is 'computer controlled'. It is always a good idea to inspect your stack laterally after setting the image dimensions with the reported Z distances, to see if that makes some sense or not. You can look at the biological structures themselves, these are very intuitive references to see if anything goes wrong. Are they abnormally flattened or elongated along the Z direction? You can also look at bright spots in a XZ projection or slice. These should provide an image similar to a PSF (you can calculate the theoretical PSF with the online Nyquist Calculator). The angle of the blur cone (see our FAQ How do you measure the Numerical Aperture (NA) from the experimental PSF?) in a Wide Field Microscope should have certain value depending on the objective's Numerical Aperture. When something goes wrong in the stepper or Z motor, this angle is immediately affected. For more information on confocal axial calibration you can have a look at the Journal of Microscopy paper of Besseling et al. which is listed at the bottom of this wiki page. What is the correct sampling? The Z sampling as reported by the microscope may not be realistic. This happens more frequently than you would think. Not because they are strange numbers but because, when you use them to describe the image, this doesn't fit at all what you would expect from your objective's NA or your biological sample. In such a case the image, interpreted with the reported sampling, produces extremely elongated objects in the Z direction!!! (The opposite can also happen, but we've seen that less). 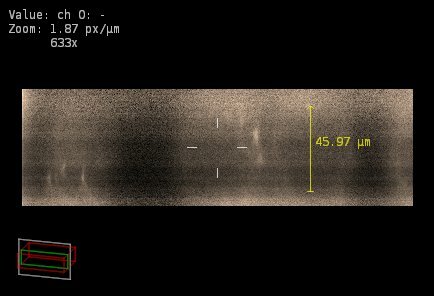 We may not know what biological sample is imaged here. I will describe this as a collection of about eight rounded objects with bright dots inside them. With this original sampling, the rounded objects as seen in the XY plane have a diameter of about 15 µm. This 3D stack, on the contrary, looks extremely elongated along the optical axis. This is unrealistic considering that the image was acquired with a NA = 1.4 lens. In this interpretation, the bright dots are actually vertical rods, and the rounded objects (which are about 50 µm tall) have an aspect ratio of 50/15 ~ 3. They are not spherical at all!!! The former can be caused by a failing Z-stepper that takes actual steps shorter than it reports. The latter can be caused e.g. by the use of a factor of 3 Pixel Binning. When binning occurs, the pixel size in the image increases by the binning factor (a binned pixel covers a larger physical region than a normal pixel). By assuming any of these possibilities, the XY slice keeps looking the same. This is because the XY aspect ratio doesn't change in any case. It would also be interesting to know how many pixels are present in the CCD camera; that would also help in deciding which of these assumptions is correct. 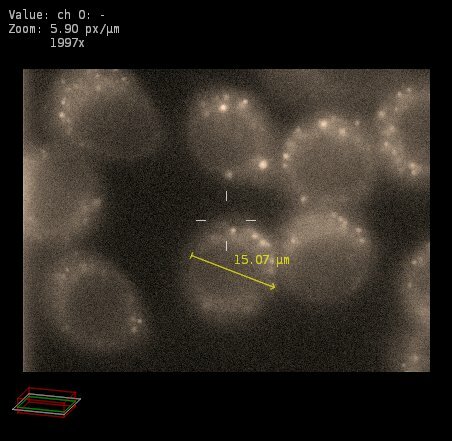 To the eyes of the biologist, the question of the size of the imaged cells should be clarifying to determine the real sampling of the image: are these cells rounded like balls or elongated like cucumbers? If they are rounded, are they ~15 µm or ~50 µm in diameter? (They are HeLa cells, by the way. By knowing that you can already reach some conclusions). 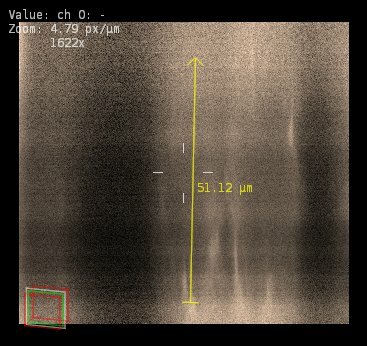 left: XZ portion of the image around a small feature, represented with the original sampling (Δx = 99 nm, Δz = 150 nm). right: theoretical PSF calculated for these optical conditions and for a depth inside the sample of 35 µm, approximately where the feature is located with the given z sampling. The imaged feature is very much elongated, and the angle subtended by the peaks caused by SA at the bottom (very dim but still visible) is very much smaller than the expected one. left: the same original XZ portion, represented with a corrected z sampling ( Δz = 50 nm). right: theoretical PSF calculated for these optical conditions and for a depth inside the sample of 10 µm, approximately where the feature is located with the new z sampling. This also suggests that the real z sampling is more on the order of 50 nm. One possibility that I had to rule out was the accuracy of the z-stage; that is, if the Z-encoder claimed to move in (for example) 0.15 micron increments, in fact the stage did advance 0.15 micron per increment. After a phone conversation with the Huygens guys this morning, I made up a 'z-calibration' slide: fluorescent microbeads (1 um diameter) attached to both a 1.5 coverslip and a glass slide. These were assembled face-to-face using a #0 coverslip spacer and the cavity filled with Cargille immersion fluid. This constructs two layers of fluorescent particles separated by (about) 100 microns within in an index-matched medium. If I understand what the computer was telling me, the software instructed the z-stage to move 540 microns rather than 100 microns in order to get from one layer to the other. I now suspect there could be an error in the encoder or other part of the z-stage control path. I am unaware of any direct z-stage encoder calibration diagnostic, but I would like to have a technician come out the check the encoder accuracy. Any other calibration sample that you can imagine (something thin, of known thickness) can be good to determine whether your stage is working properly or not. Another possibility is e.g. an electron microscope carrier grid between a glass slide and a coverslip: the EM carrier grids use to have a determined thickness and holes through which you can image the reflections on the two pieces of glass. BESSELING, T.H., JOSE, J. and BLAADEREN, A. V. (2015), Methods to calibrate and scale axial distances in confocal microscopy as a function of refractive index. Journal of Microscopy, 257: 142–150. doi:10.1111/jmi.12194. In this article two easy methods are described to calibrate axial distances in 3D confocal microscopy. (*) Images and quoted text courtesy of Dr. Andrew Resnick, Department of Physiology and Biophysics, Case Western Reserve University. Used with permission.